I have a problem with a python script that is getting killed due to, what I believe, low available memory but I hope is a bug. Description as follows: I have a python script that loads 12 large (1-1.5 Gb) files into memory. The reason for this is that each is a experiment file and I am doing cross-experiment analysis. I could do this without a problem on my current machine when it ran OSX High Sierra. But since I upgraded to Mojave the script fails. The script fails during the loading of the files. A warning is issued (see image) which states that my disk space is critically low. I have previously been able to run the script with less than 50Gb free disk space. I have now cleared a lot of data and currently have 300+ Gb free space. A few seconds after the warning is issued the script is Terminated. Right before the termination, if i follow the script process in Activity Monitor, the Virtual Memory Size is at ca 140 Gb, Memory Used is at 13.61 Gb, Cached Files at 2.0 Gb and Swap Used is at 11.43 Gb. In the Terminal there is no stack trace, it just says “Killed: 9”. So, I guess that this is not a issue with python but with the OS. Since I dont get any stack trace and the only warning is the “critically low disk space” one, Im not sure how to attack this issue. Of course I can rewrite the script and to a lazy loading of partial data as needed, but that will take alot of time and root of this problem would be unsolved. EDIT: After a night in my backpack it now runs. No idea why. 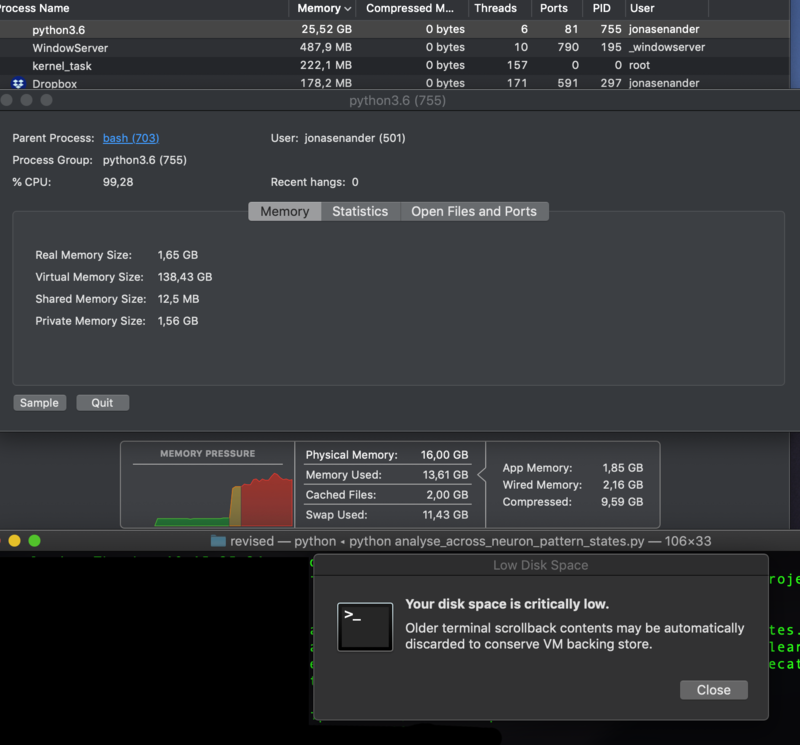 Browse other questions tagged terminal hard-drive memory mojave python . Why do I get back more disk space when I restart my Macbook on Mountain Lion 10.8.3?